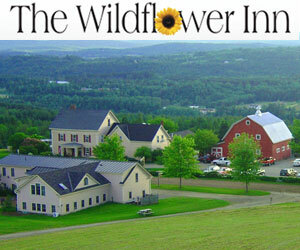 In true Vermont Bed and Breakfast form, The Wildflower Inn proudly serves up extraordinary country fare each morning featuring their own homemade Vermont Maple granola – delicious! Your choice of the daily special, organic eggs – any style – with maple smoked bacon or sausage, and toasted homemade bread, or you can try their signature buttermilk or blueberry pancakes topped with sweet Cabot butter and fresh VT Maple Syrup from the Inn’s sugarbush. Recommended by Yankee Magazine’s Travel Guide to New England, New England Travel and Life, Vermont Magazine, Vermont Living, and National Geographic Traveler. This Northeast Kingdom Vermont country inn offers great family fun, romantic getaways, kids activities and programs, skiing at nearby Burke Mountain Ski Resort, spectacular fall foliage viewing, and an authentic country vacation experience with old-fashioned charm and hospitality – everything you’ve been dreaming of for your Vermont family resort vacation getaway! A highly recommended Northeast Kingdom Vermont Inn. Ask us about St. Johnsbury – Northeast VT lodging. If you would like to feature your Northeast Vermont Country Inn, Lodge or Bed Breakfast Inn to this web site, please contact us.